Did you know that over 90% of the wine produced in the United States is made right here in California? I just learned that. Sometimes, you randomly are in the depths of the internet and you find some data in a hideous table and you just *have* to visualize it! 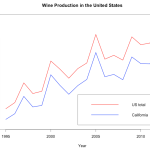 Here’s a brief how-to with some fun data on wine!! So, you bought and installed a shiny new graphics card on your Linux machine. Congratulations! Now to make use of it by playing some video games! Unfortunately, there’s not a lot of games out there for Linux. Fortunately, there’s a thing called WINE, which is sort of like a Windows emulator, but not really. It’s basically a layer of code that makes (most) .exe (Windows-only) programs work (kinda) on Linux.